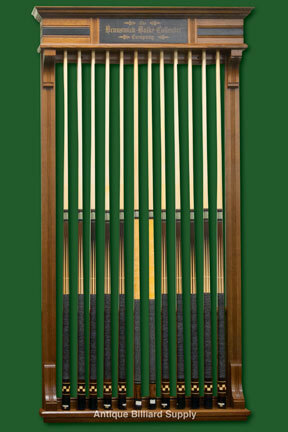 #5-08 Handsome wall-mounted pool cue rack of a style to accent any Brunswick antique pool table. Decorative crown panels with recessed detail. Fluted vertical side panels. Solid oak construction with dark brown finish. Holds 12 cues.